Where do I find it? And how do I read it? Reading the Bible is fairly simple… but to make it even easier to digest, here are a few guidelines to follow. The Bible is divided into two parts. The first part (the Old Testament) was written from the creation of the Earth and ends before the birth of Jesus. The second part (the New Testament) was written from the birth of Jesus and ends after the early apostles. When you read the Bible, start with the New Testament (NT). You might want to read one of the gospels (the first four books in NT) to get an idea who that Jesus guy really is and what he said. You may also want to write the 5th book (Acts of the Apostles) and/or one of the other books, such as James, 1. and 2. Peter or Paul’s letter to the Ephesians (don’t start with Revelation, since it is a vision, making it fairly difficult to understand). Read the New Testament as though everything happened yesterday around where you live… because practically everything it says still happens today. What is in the Bible is 100% true. Therefore, it’s not enough to read the Bible and think “great – this is for everybody else”… It is actually for you! Do you believe in Jesus – in the Word? If you do, then DO what it says… and BECOME what it says – REST in the fact that it is for YOU who believe in Jesus. …you are a child of God – BECOME a child of God. …you are in the light – then STAY in the light and put the darkness behind you. …you have been ransomed from sin, death, guilt, and shame – so LIVE in freedom from those. …you are an ambassador for Christ – so BE a representative and a spokesperson for Jesus. …God is for you, so nothing evil can overcome you – so don’t live in fear. …love is the most important thing – so kill your pride, your ego, and your inferiority – LIVE in love and care. …you must bury your old life in sin and convert – so be baptized (full submersion) and convert. …you must heal the sick – so lay hands on the sick and heal them. …you must drive out demons – so kick them out. BECOME and DO the things you read… because THE TRUTH (the Word) will set you free. So then, my beloved brethren, let every man be swift to hear, slow to speak, slow to wrath; 20 for the wrath of man does not produce the righteousness of God.. If anyone among you thinks he is religious and does not bridle his tongue but deceives his own heart, this one’s religion is useless. You can read the Bible no matter where you are… and that means regardless if you are in your room, out in nature, on the toilet, or in bed. God’s word can be read regardless where you are and what you are doing…! Jesus is the bread of life (John 6:36 and John 6:51) and the living water (John 4:10) – so fill up on the word and on fellowship and friendship with Jesus Christ. “Eat” and “drink” and let the Holy Spirit bring the text and your relationship with Him alive in your life… but remember that after eating and drinking, you also need exercise…. You get that by acting on what you read. If you ONLY read and never act on what you have read, you may as well not bother! Provoking…! Satan knows the entire Bible too… because he was there when it was written – and Satan not only believes in God, he KNOWS that God is there! Satan has simply chosen NOT to obey God. But everyone who hears these sayings of Mine, and does not do them, will be like a foolish man who built his house on the sand. If you abide in Me, and My words abide in you, you will ask what you desire, and it shall be done for you. By this My Father is glorified, that you bear much fruit; so you will be My disciple. As the Father loved Me, I also have loved you. If you keep My commandments, you will abide in My love, just as I have kept My Father’s commandments and abide in His love. When reading the Bible, DON’T “rush” through it. 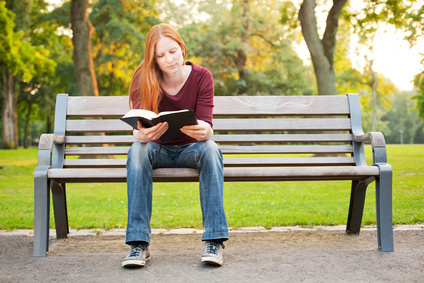 It is not about reading a lot in a short time, but rather about allowing the Holy Spirit to reveal the text to you. Therefore do not worry about tomorrow, for tomorrow will worry about its own things. Sufficient for the day is its own trouble…. Now, hold on a minute! What does that mean…??? What is the kingdom of God…?? And what does it mean FIRST to seek the kingdom of God and His will? What about the added things..? Am I actually seeking God to get the added things? – or am I seeking him whole-heartedly and doing His will?? And if I first seek the kingdom of God and his will, what are the consequences for me? And what will be the consequences of following Him…??? So, don’t rush through it, but stop and think about what you are actually reading and what it means…. This will give you a brand-new understanding of the word of God.